Ronzoni® is part of the New World Pasta family of brands, a leading dry pasta manufacturer in the United States. Great tasting pasta that saves you time by cooking in 3 minutes! 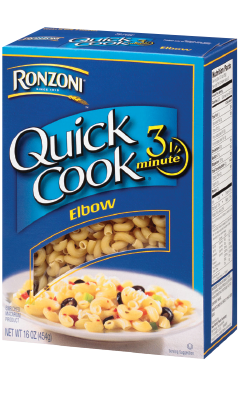 Ronzoni® Quick Cook® Elbows cook in only 3 minutes! Most commonly associated with "Macaroni & Cheese", Elbows can also be used with tomato-based or creamy sauces in entrées, salads or sides. Tip: Cook 1 box of Ronzoni® Quick Cook® Elbows and add your favorite pasta sauce with ground meat and top with Parmesan for an easy meal! SEMOLINA (WHEAT), DURUM FLOUR (WHEAT), NIACIN, FERROUS SULFATE (IRON), THIAMIN MONONITRATE, RIBOFLAVIN, FOLIC ACID. MANUFACTURED IN A FACILITY THAT USES EGGS. Products labeled Yes under the ‘Gluten Free’, ‘MSG Free’, ‘Preservative Free’, or ‘Allergen Free’ columns reflect a product which does not contain or are ‘free’ of that item. Products labeled YES under the ‘US FDA Labeled Allergens’ columns reflect products which contain that item.